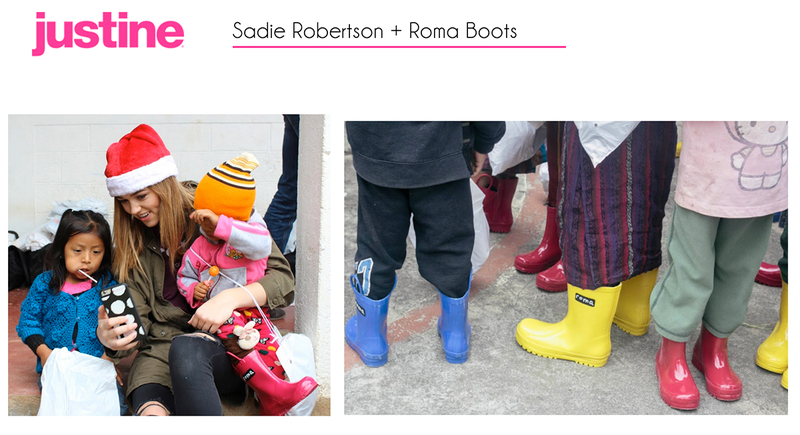 Congratulations to our Client Roma Boots for their feature on Justine Magazine! Sadie Robertson, Duck Dynasty princess, DWTS runner-up and former Justine cover girl, has won our hearts yet again. Last month she and the fam packed up and headed down south to Guatemala to donate hundreds of pairs of boots to children in needâ€¦ but they werenâ€™t just any boots! Theyâ€™re Roma Boots. Roma was founded on a â€œbuy one, give oneâ€ philosophy, donating to children in more than 25 countries across five continents. Roma doesnâ€™t sacrifice style. Thereâ€™s truly nothing cuter than these colorful boots on children across the world, but the designs and styles (specifically Sadieâ€™s Live Original collection) are totally adorable as well. Find out more at romaboots.com!